The settings you use when taking a photograph affects the shot outcome. Before choosing camera control settings, first choose the camera mode. Here is an explanation on the ‘Command’ or ‘Modes dial’ where you make that choice. These settings, when balanced, create an optimal exposure. You need to understand these settings to go manual with your camera. The Command or Mode dial sets the camera to use particular controls. You see a typical example of the command dial above. ‘Auto-mode’ or ‘Auto’ – the camera does everything for you. This setting is sometimes called the “green square” or Green mode. It’s normally green on the command dial. Using Auto you hand over full control to the camera. It provides a set of fairly average exposures. It’s used to snap basic shots in everyday situations. To make your photography really effective you want full creative control. Learn to use the semi-manual modes and ‘Manual’ Mode. These give control to the three exposure factors. The picture shows these settings as ‘M’, ‘A’, ‘S’ and ‘P’ in a silver band. M – the full Manual setting. You have full creative control over exposure. A – Aperture – you set the aperture (f number) and the camera finds the right shutter speed for you. S (or Tv) – the shutter speed setting or Time value. It sets the shutter opening time. The camera finds an aperture setting to match. P – ‘Program’ allows some menu settings that ‘Auto’ will not allow. This auto setting gives only limited artistic control. Also… B (not shown) means ‘Bulb’. It’s a setting for long exposures of more than 30 seconds. Bulb may not be available on all cameras. There are often other modes available. But these are really pre-sets. They do the same thing as manual and semi-manual modes. However, they give you less than full control over your shot. So I am not going into them here. Mike Browne goes through these settings (except ‘Bulb’). He explains the ideas and points out each mode. Remember, the command dial only sets the exposure controls for Auto-modes. The manual and semi-manual modes allow you to change the exposure factors from other controls. 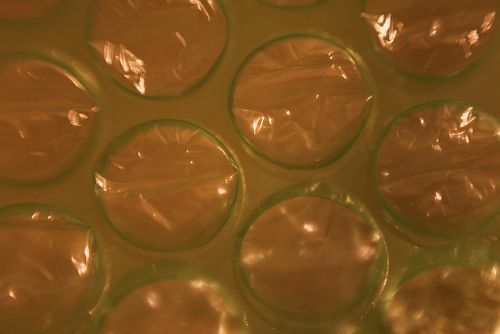 Green bubble wrap shot with Canon 50 mm f/1.8 lens reversed. Hand-held to the camera body. Anyone can use reverse rings. 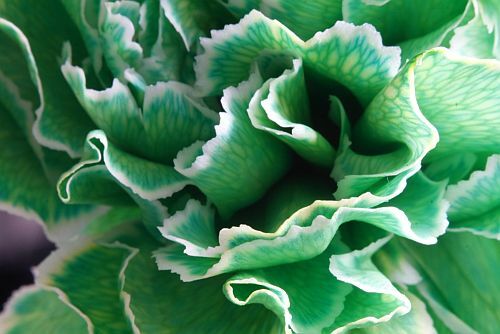 Close-up or macro photography is something every photographer should try. However, a macro lens can be an expensive investment. This series covers inexpensive ways to get great close-up results. The first article “Inexpensive Close-Up Photography – close-up rings” discussed using close-up lenses that attach to your existing photographic lens. A second way to achieve close-up results, surprising as it may sound, is to reverse your DSLR camera’s lens by mounting it on backward. It is possible (but awkward) to simply handhold your lens backwards against your camera body, as in the top photograph. I don’t recommend it, as it can allow dust or other debris into your camera that may affect the sensor. The inexpensive alternative is to purchase a reverse ring camera mount adapter that fits your lens (based on its diameter) and the make and model of your camera body. 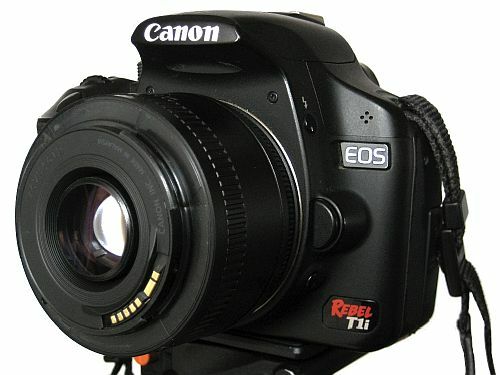 Canon 50 mm f/1.8 lens attached backwards to a Canon T1i body using a reverse ring. The depth of field preview button is visible underneath the lens release button. First, remove any filters you have on your lens. To use a reverse ring, screw the ring securely on to the front of your camera lens filter thread. Hint, it is easiest to screw the ring on while the lens is in the camera body. After attaching the reverse ring to the lens, remove the lens from the camera body. Now reverse it and fit the lens-mount side of the ring into the camera body and lock it in place. You will no longer be able to use the autofocus function of your camera or adjust the aperture of the lens once it is reversed, but you will be able to adjust the shutter speed and ISO. Your camera may display an aperture value of F00 or other default. I recommend that you change the shooting mode on your camera to aperture priority or manual. In aperture priority mode, the camera will calculate and set the shutter speed for you, while in manual, you will set it yourself. Now you are ready to use the lens. Origami paper crane folded from a bite-sized Hershey wrapper. A reverse ring gives better results when used with a prime lens rather than a zoom lens. Prime lens are often faster, which means that they have a wider maximum aperture and can use a faster shutter speed, even in lower light. You can use any type of lens, although light lenses are recommended. Very heavy lenses may damage the reverse ring mount adaptor or the lens filter thread. Using a zoom lens, particularly when fully zoomed out, can be awkward to support. Because the lens is reversed, zooming the lens requires you to be further from the object you are photographing and does not give such a close-up view of the subject. 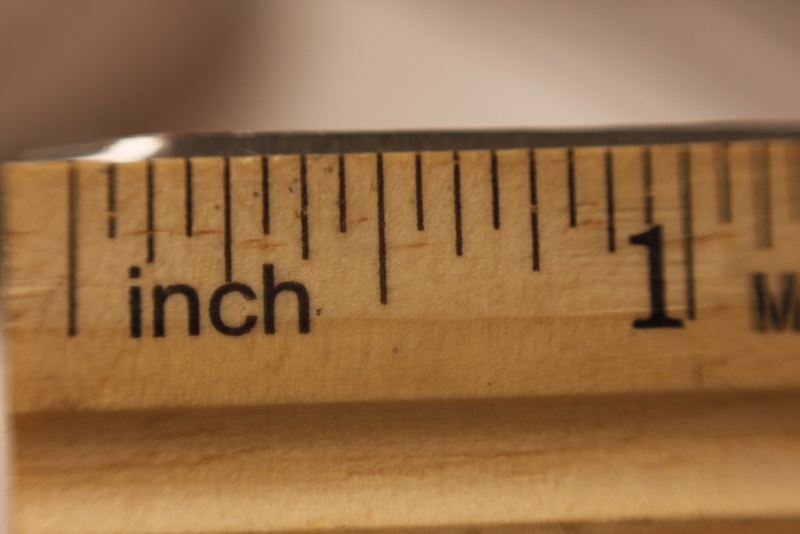 The working distance (distance from the lens to the object in focus) is about five inches with the Canon 50 mm f/1.8 lens reversed. Using my Tamron 18-270 mm zoom lens at 18 mm, I have to be within about two inches to get an object in focus, while it is greater than six inches at 270 mm. When your camera lens is not attached to a camera, its default position is to be open to its widest aperture. So, for the Canon 50 mm f/1.8 that would be f/1.8, which results in a very shallow depth of focus. In the crane picture above, the neck of the crane is in focus, while the beak and tail are not. When I reverse this lens on my camera, the aperture will still be f/1.8, and I will be unable to adjust the aperture value after the lens is reversed on the camera. But there is a work-around. Most DSLR cameras have a ‘depth of field preview’ button. The purpose of this button is to allow you to look through the viewfinder and see exactly what your camera will see at the aperture that is set. 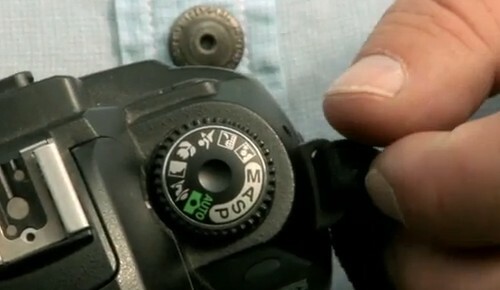 When you press that button, the blades inside the camera lens close down to the selected aperture. This will allow you to set the aperture for your lens. (Please note: not all DSLRs have a depth of field preview button). Here is the procedure. Using aperture priority or manual mode on your camera, dial in the aperture that you want to use for the shot. Next, depress and hold the depth of field preview button. While still holding down the button, press the lens release button and remove the camera lens. Then you can mount it on your camera body using the reverse ring. The camera lens will maintain whatever aperture you had selected. If you want to return to the default position or change the aperture again, simply put the lens back on the camera the regular way and repeat the process. Tip: if working outside, you may want to set your aperture first and reverse the lens indoors, to avoid dust getting into the camera body and on the sensor. The reverse ring is a fun and easy way to experiment with close-up photography. The ring itself is very inexpensive, usually less than $10 USD (around £7-£8 UK), and is small enough to fit in a purse or pocket. Depending on the lens that you reverse, you can get very close to macro-level results. This photograph of a ruler demonstrates the scale of a reverse-mounted Canon 50 mm f/1.8 lens, which gets down to an image of about an inch and a quarter wide and has a working distance of about five inches. Like other close-up techniques, using a reverse ring does require you to be physically close to the objects you are photographing. 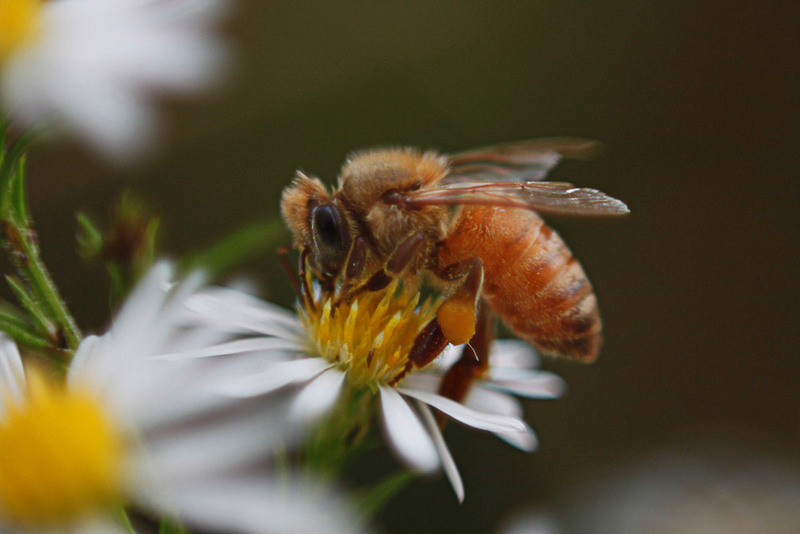 Depending on your lens and your comfort level, however, you may still be able to capture detailed shots of slower moving insects, such as the bee below. A reverse ring is also ideal for indoor shots or other stationary details. Bee photographed using a reverse-mounted Canon 50 mm f/1.8 lens. You will lose some of the automatic functions of your camera, including autofocus, with a reverse ring. The electrical contacts that normally carry signals to the lens are not in contact with a reversed lens. This is not that much of a disadvantage. 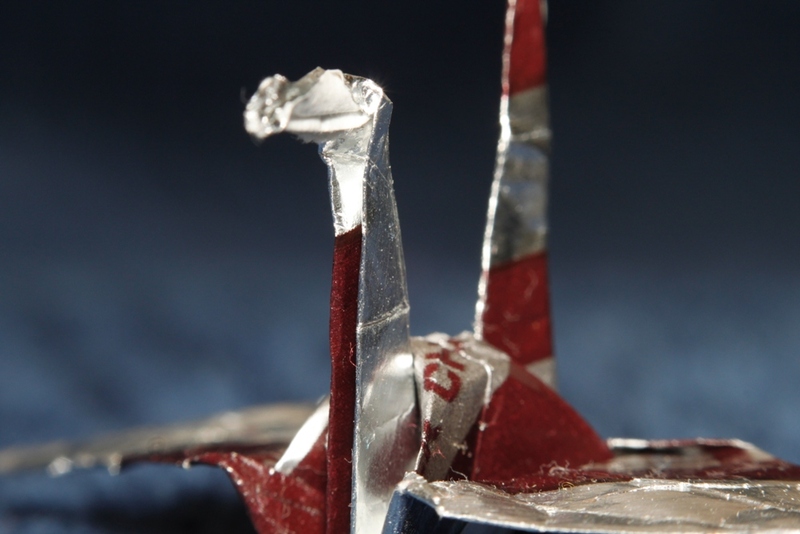 Generally, with close-up shots, you get better results when using manual focusing. While you can adjust the aperture (on some cameras), there is an additional step of setting the aperture using the ‘depth of field preview button’ before reversing the lens. As with any close-up or macro technique, the depth of field (area in focus) will be very shallow. You can maximize sharpness by keeping the camera lens parallel to the object being photographed. In the photograph of the bee, above, the body of the bee is parallel to the camera lens and stays in focus. The flower is perpendicular to the lens and falls out of focus quickly. Another technique to maximize sharpness is to use a smaller aperture like f/22, but this may require a longer shutter speed than you can easily hand-hold. You can solve this problem by using a tripod for stationary objects, which allows you to use a longer shutter speed to achieve the desired sharpness. All close-up techniques benefit from the additional stability of a tripod. Although, as you can see from the shots above, you can get effective results from hand-held techniques. Overall, a reverse ring is an inexpensive and portable way to use your existing lens for close-up photography. Depending on the lens you reverse, there is enough working distance to photograph insects, flowers, or any other small subjects that interest you. There is flexibility to adjust the aperture value before reversing the lens, which gives you a little control over the depth of focus. 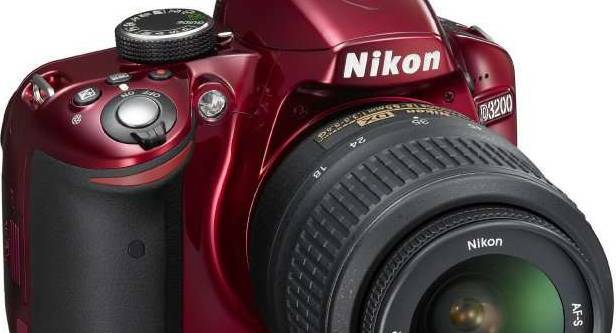 It is an inexpensive option to get you started in the tiny world of close-up photography. Using a reverse-mounted Canon 50 mm f/1.8 lens at f/1.8. Part 1 of this series focused on using close-up lenses. Part 3 will cover extension tubes, and Part 4 will bring all these techniques together with a range of close-up ideas and tips. Get the manual out. Learn a technique from the manual. Then go out and use that technique. Repeat (1) in six months. Using your camera will become easier and your memory will be refreshed. The most fun you can have in photography is with friends. Join a club, find some other camera owners, join a website that shares comments… whatever you do – get people to look at your photos and help you with tips and tricks. Read “Seven deadly photographic sins” and realise that you should concentrate on learning everything about the equipment you own. Once you are an excellent photographer with your current equipment then consider new stuff, but not before. Shoot with the largest file size and highest resolution. If you do not know how to do that consult the manual. This is important. 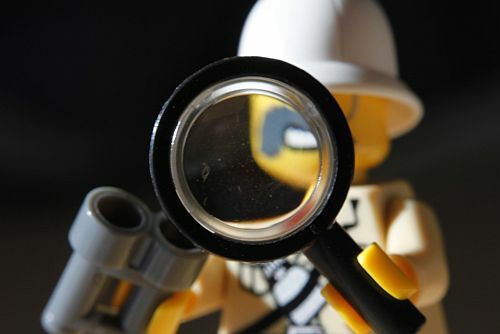 Using tiny files and low resolution will really frustrate your improvement. Beginners often click away without checking the image. Shoot-and-hope mostly fails. Check your screen, check and check again. Reduce the number of shots you take. Concentrate on composition – make the images you do take higher quality. Read up on “Chimping” the gentle art of screen checking! Constant deleting shortens the life of your memory card – only ever format the card. Unless very experienced you are probably not qualified to say if a shot is good or bad. You cannot possibly tell if an image is good enough in the low resolution of a camera screen. As your ‘eye’ develops you will change your idea of what is a ‘delete’. I have seen an image voted Best-shot-of-the-day but listed as a deleter by the author before the vote. There is only one sure test of sharpness, look at the image in full resolution. When you pull the image up on screen it is reduced and sharpened. Expand it to 100% to see it as you took it. Read your software manual to see how. Find out all you can about light – all types of light and all sorts of lighting situations. 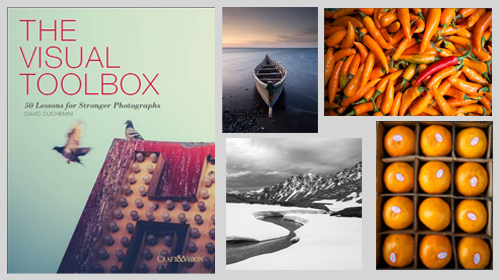 You can find a whole range of resources here… Light and Lighting – Resource pages on Photokonnexion. Your knowledge of light will make you a great photographer if you focus on that alone. The best sharpness tool is using a tripod. Never forget your tripod and you will always have sharp images! Are you in control of your shots? DSLR camera controls are simple to master. 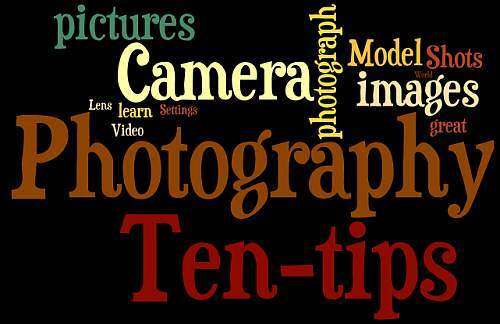 Learn to use them and you will have full control of your camera. Today we are starting a short series on getting full control of your camera. “Going Manual” is about learning the essentials about how to control the settings you need to get a great exposure. This article examines why you should consider kicking the ‘auto’ habit and introduces the three controls you will be learning about. “Auto settings” in modern digital SLR cameras are ‘averaged’ shots. In a full ‘auto’ shot the camera looks at the conditions in which it is taking the shot. After taking sensor readings it calculates an optimum exposure. Then the camera sets itself up to take the shot. Snap! The shot it takes is the result of its programming. What you get is an ‘averaged’ shot based on its optimisation. The only choice you get is to focus the shot on a subject. If you are using auto-focus, even the fine detail of the focus will be left up to the camera. So, the question is, did you take the photo? Or, was it the lab boffin who worked out the programming? Modern digital SLRs also offer you a range of pre-set modes. These provide you with a ‘mode-choice’. You choose what type of ‘averaged’ shot you want. Taking a picture using a pre-set mode is telling the camera to set up the shot for you. You are asking the camera to create an exposure based on a few simple pre-set conditions. Programming boffins have looked at classic shots in particular situations. They have programmed the camera to reproduce those ‘types’ of shots in the pre-set modes. When you choose portrait mode you get an exposure that is frequently used in a classic portrait shot. If you choose landscape mode you get an exposure which is frequently used in classic landscape shots. While these pre-sets create reasonable pictures, the camera controls the outcome. Creating the photograph you want is taken away from you. You are getting the exposure that is ‘frequently’ used by other people. It may not be ideal for the shot you want to make. It is simply how lots of people do portraits. To make your own, unique, picture you will need to take control. An ‘exposure’ is the light-data recorded by the image sensor when it’s exposed to light. Controlling the light determines what the sensor records. The way the light is controlled gives you some unique artistic effects and results. When a camera takes an ‘auto’ or ‘mode’ picture the camera controls the exposure. Modes and auto are ‘averaged’ programmed shots based on a boffin’s view of common or classic exposures. Spend time learning to work with ‘modes’ and you will only get ‘averaged’ shots. Alternatively, you can go straight to the heart of the matter. You can learn to directly control the exposure. Learn the simple camera controls and you will be able to take unique pictures that reflect your idea of the shot. Your control will reflect your choice and match the way you want the shot to come out. It will be your creative choice. The trick is to set the controls to manage the light entering the camera. The aim is to create a balance of light the camera sensor can capture to produce a pleasing result. Shutter speed – how long the sensor is exposed to the light. Over the next few posts we will be looking at how you can use these settings to control your exposure.